Today's post is about a strange-looking caste of ants known as honey ants. 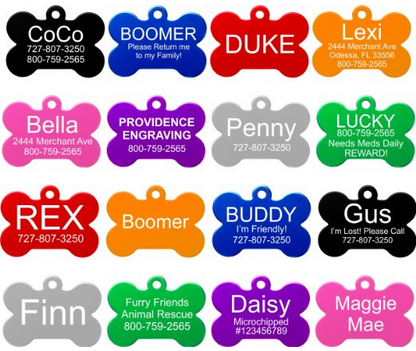 What is their role in the colony? Why are they so...fat? And are they full of... honey? 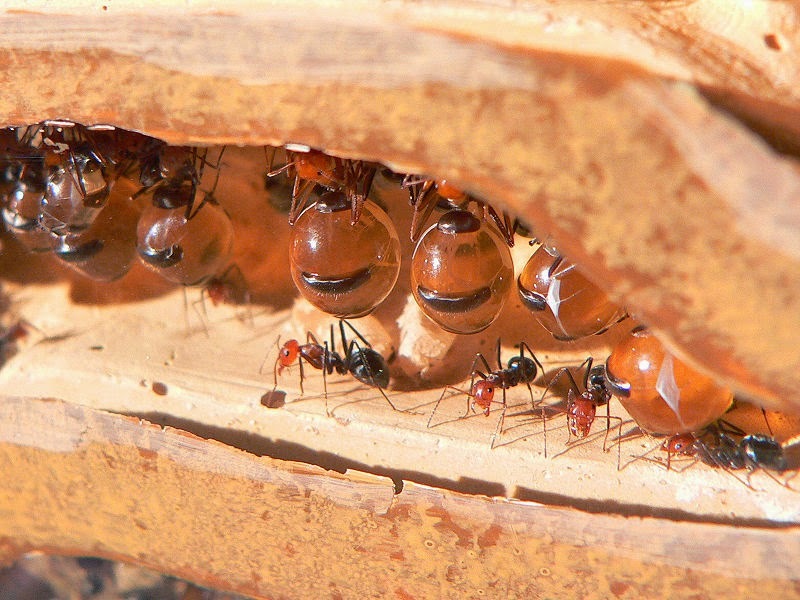 Honeypot ants are a special ant-class, occurring in certain species. As most of us now, ants are social insects that form colonies consisted of several castes, with each caste having a specialized role. The queen lays eggs and is the mother of the colony. The few males are called "drones" and their role is to one day mate with the "princesses" born by the queen. However, the vast majority of the colony is comprised by sterile females. 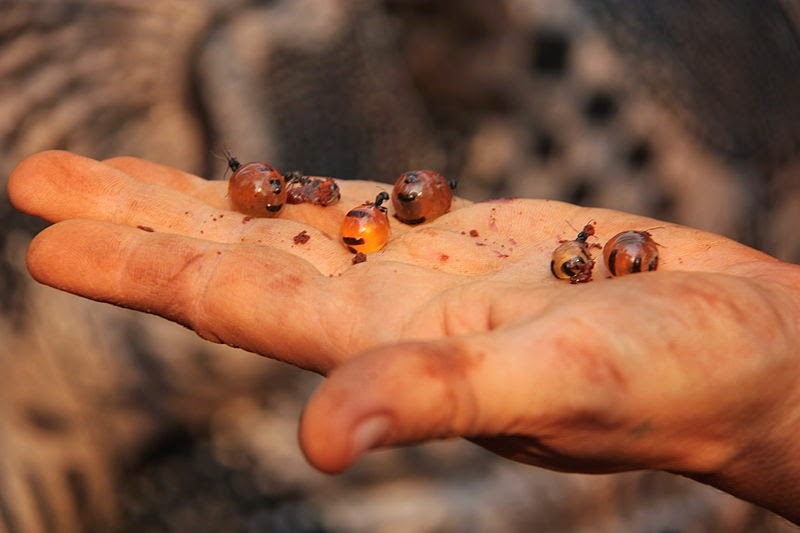 These ants become "workers", "soldiers" and other specialized groups, like honeypot ants. Honey ants are primarily found in hot and dry areas throughout the world, where food and water becomes scarce for long periods of time. Many of them occur in extremely hot deserts whereas some reside in transitional habitats. Some of them can also be found in woodlands with cool but very dry climates. As aforementioned, their role is to gorge themselves with food presented to them by workers. The food is stored in the abdomen, in the form of water, liquids and body fats. Individuals may occur throughout the whole nest, however they are typically found in the deepest parts of the nest, hanging upside down from the tunnels' ceilings. There, they spend their whole life trapped due to their large abdominal size. They only take action when needed..And that is during tough periods, when there isn't enough food to sustain the colony. Depending on the species, they either sacrifice themselves and are consumed by other ants, or they simply spit out the stored ingredients. 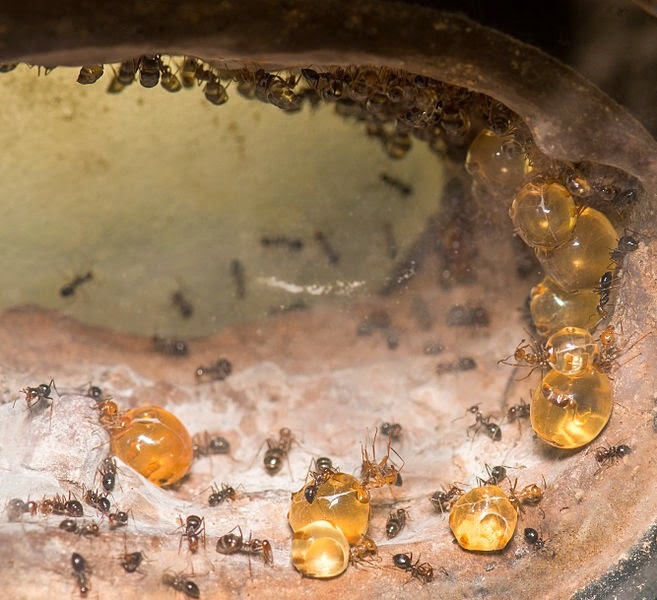 In the second case, the workers stroke the antennae of the honeypot ants, triggering them to regurgitate the stored liquid. In some species of Erebomyrma, Oligomyrmex, Pheidologeton and Proformica, workers become honey ants for only brief periods of time, storing smaller amounts of food. Honey pot ants are usually presented with flower nectar and other plant fluids that are rich in sugars. They also feed on liquids from insects, aphid honeydew, dead animals, and other sources. But how are they fed? Workers leave the nest in search of nectar, insects, honeydew, plant secretions etc. Once they find something useful they consume it and return back to the nest. Then, they pay a visit to their immobile friends and regurgitate part of their meal and feed them with it! Many, if not all, honeypot ant species, like the Camponotus inflatus, are edible, no preparation required. Just grab the critter and bite the...honeypot! Supposedly, the liquid has a very sweet taste and is good source of sugars. Honey ants are considered a delicacy in many parts of the world. In Australia, they are an occasional part of the diet of several Aboriginal tribes, who regard them as a delicious dessert. What a treat! Excerpt from a BBC documentary about honeypot ants. - Honey ants were first documented in 1881, by the American naturalist, Henry C. McCook (1837 - 1911). 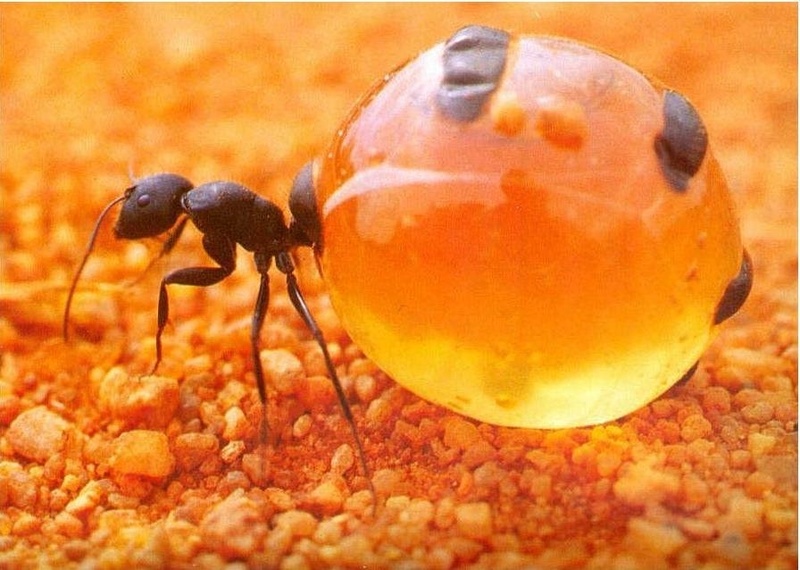 - Honeypot ants are extremely precious to the nest for its survival. It's no surprise that there have been reports of other ants attacking colonies to steal their honey! - Morgan, R. Biology, husbandry and display of the diurnal honey ant Myrmecocystus mendax Wheeler (Hymenoptera: Formicidae). Where do the Myrmecocystus spp live, underground like the australian ones in the video? God is awesome the way He creates everything with a purpose and so perfectly!Praise Jesus!